This boost will leave you feeling calm and energised as it nourishes and replenishes the body with nutrients leaving you with a healthy buzz. Herbs: Gotu kola*, Licorice*, Withania*, Reishi, Siberean ginseng*, Rhodiola, Shisandra*, Matcha*. Greens: Spirulina*, Barley grass*, Wheat grass*. Fruit and Vegetables: Beetroot*, Lemon, Coconut water. 33 servings per pack (3g), for every day use. 20 servings per pack, (5g), for an immune super boost. Each (3g) serving is equivelant to; 126g of fresh herbs, 240g of fresh greens, 120g of fresh fruit. Each individual herb, greens, and fruit powder used is up to 20 times more concentrated then the raw material giving you a higher dose of nutrients in each serve to help you in feeling your best. 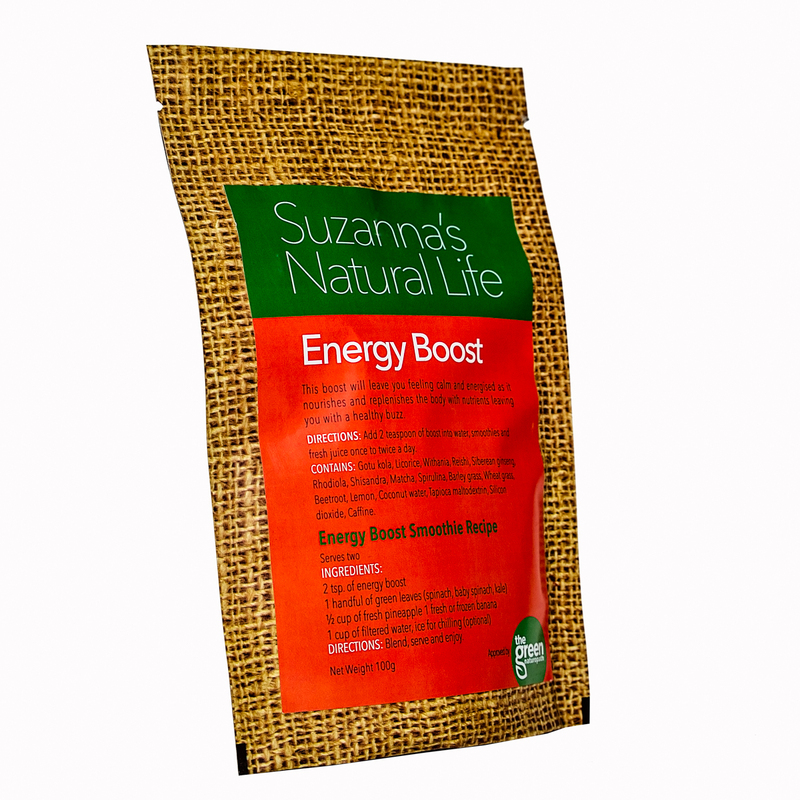 Energy boosts green mixture of Spirulina, Barley grass and Wheat grass helps to improve detoxification and digestion assisting in nutrient absorption. High in protein, minerals and vitamins makes this green blend a perfect natural multivitamin without the nasties and synthetic nutrients found in most multivitamins. Beetroot helps increase oxygen intake bringing energy to the brain while Lemon and Coconut water help flavour this boost naturally assisting the cells with hydration, electrolyte balance and potassium which helps to naturally stimulate brain and nerve function. Boost powders are to assist in maintaining health and do not claim to cure any acute or chronic health issues. Check with your health practitioner to work through health issues that require practitioner assistance. Be sure to check if this boost powder is suitable for you if you are pregnant or trying to fall pregnant, on medication and / or dealing with complex health issues. If you have any unexplained symptoms please check with your Doctor or Specialist. Contact the Green Naturopath for further information.